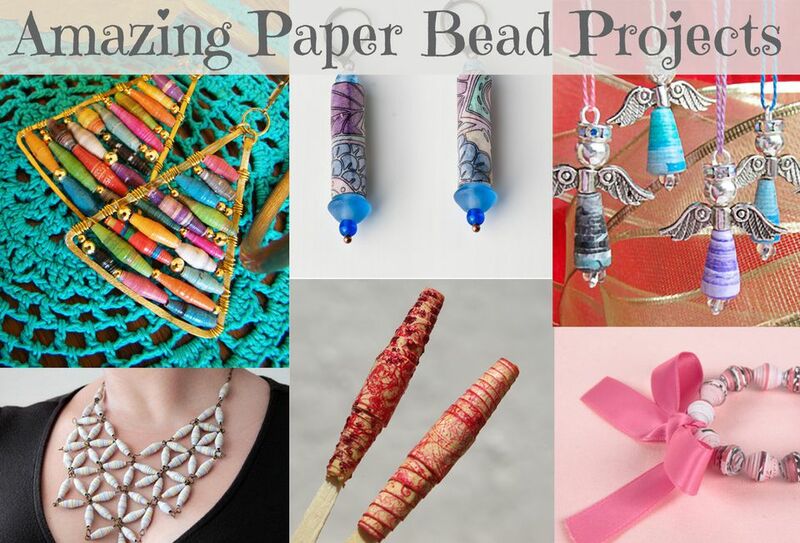 If you are looking for some projects which are low cost and quick to make, but which give you the foundations for some beautiful items of jewelry and accessories, paper beads might be just the thing. The wonderful projects on the following pages all start with sheets of paper which are transformed into stunning beads. You'll find tutorials for making paper beads in a variety of styles as well as projects showing you how to use them. In addition to the ideas here, sign up to get crafting inspiration delivered to your inbox each week. Happy browsing! If you have never made paper beads before then don't worry! We have a tutorial and free pdf template to get you started. One of the great things about making paper beads is that you can use recycled paper or get your own custom look by decorating paper with rubber stamps or using decorative paper in a certain color scheme. When you have made a paper bead or two check out the following pages for ideas of how you can use your beads. An alternative to making your paper beads from scratch is to use printable paper bead designs. These are designs that you just need to print, trim and roll to make your own beads. If you use a black and white design, you can color the beads before rolling to create your own unique effects. Etsy is a great place to find printable paper bead designs. You will find the paper bead sheet to make beads shown above here - Printable Black and White Paper Bead Design. This necklace is so simple to make. Just thread some paper beads onto a chain or cord and interspace with glass beads. Looking to make paper beads to match a certain color scheme? Try stamping plain paper with rubber stamps using the correct colored ink or adding some dabs of paint to create your own custom designs. The Vera Bradley website shows how to make a stunning paper bead bracelet using strips cut from an old desktop calendar. Beautiful! Vegan Lovelie shows how to make stunning paper beads and add resin to give a marvelous sheen. You'll also find tips for creating different shape beads. Tally's Treasury shows us how to create paper beads which are a little different. Use a thicker paper or cardstock to make robust but lightweight beads. Wow! Learn how to make these large, stunning paper beads at the Paper Beads website. This tutorial shows how to make paper beads from wallpaper. The texture of the wallpaper adds a depth to the beads. Learn how to transform you handmade paper bead earrings into Anthropologie inspired hue pyramid earrings. Learn how to use simple safety pins to turn your paper beads into a stunning bangle. This clever construction makes a striking feature necklace. This tutorial shows you how. Turn your handmade paper beads into cute angel charms. Here's a variation on paper beads. What a great way to make eye catching jewelry. Here's a quick way to brighten up a bag. Thread a few paper beads onto a large safety pin (or kilt pin) and attach this to the shoulder strap. Here are some tips for creating your paper beads. Remember to add decorations to your beads for additional interest. I added glue dots and stamped the paper with rubber stamps to make the bead above. Cut the paper as evenly as possible if you want a regular shape to your beads. The finished bead, however robust it feels, will need sealing with a waterproof sealant such as varnish. Some people use nail varnish - this is great for short term sealants but it will wear off. For a more permanent finish you could consider resin. Try different types and thicknesses of paper. You will find you get very different results. Handmade Card Making Tips: Don't Forget The Back of Cards! How to Start a Successful Handmade Business Selling Cards and More!